You might not have heard about it when Marissa Mayer, now 40, took on the job of president and CEO at Yahoo in 2012, with a six-month starting compensation package of $36.6 million that included stock options. Getting a nice job doesn’t always generate headlines but Mayer is young, female, and on the day in July Yahoo announced it lured her away from Google, Mayer announced she was pregnant. Her son, Macallister, was born in September. During the last stages of her pregnancy, Mayer did what a lot of Yahoo’s expectant and new mothers did; she worked from home (a penthouse suite at San Francisco’s Four Seasons Hotel). When baby Macallister was just a couple weeks old, Mayer returned to work; her office suite had been revamped to include an adjacent private nursery for the baby. She ended the company policy that allows telecommuting (no more working from home for anybody). She extended maternity leave to 16 weeks, with pay, but with stipulations. 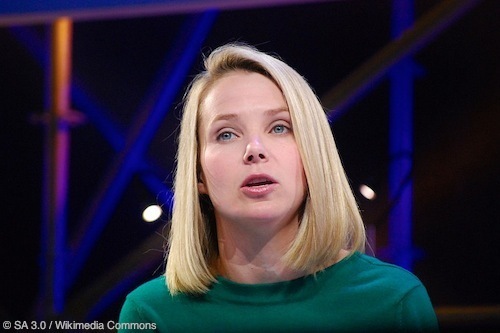 Yahoo’s new 16-week paid maternity leave policy covers only women who give birth. All new fathers and mothers who gain a child through adoption, foster care, or surrogacy get only eight paid weeks off the job. All new parents get $500 to spend as they choose (“daily habits reimbursement”). Mayer recently announced she is expecting twin daughters, due in December, and she will again take no more than two weeks’ leave after their birth. The United States falls far behind most developed countries of the world for its family-protection policies but there has been mounting pressure in recent years to adopt minimum maternity leave requirements on a federal level. Doing so is expected to help families financially while maintaining familiar standards of living. Longer time spent bonding with a new baby has been shown to benefit the baby’s developmental and social skills well into childhood. When women can return to work gently after a new baby joins the family, they are more likely to return to work, saving America’s employers the time and expense generated by constant employee turnover. Mayer’s critics suggest her speedy return to work after childbirth undermines these arguments in favor of more family-friendly leave policies. Some question whether the example she’s setting is a good one. Others argue lavish leave policies, especially those in Silicon Valley’s trend-setting high-tech companies, are for the women who need it the least, like Mayer. Women who work for hourly wages in non-executive positions would benefit far more than the women at the top. Single mothers without a maternity leave safety net are usually the hardest hit parents in a company, without income to stay home with a new baby and no one to babysit while they work. A recent article in US News & World Report references the link between mother-child bonding and the child’s educational outcomes. Developmental gaps between children of the affluent and those less fortunate are measurable in infancy, with the gap widening as children approach school age. One factor that contributes to the gap is a working mother’s inability to breastfeed/bond effectively. Another is the higher rate of depression in new mothers who return to work soon after having a baby. Adding to the educational woes of a nation without a standardized maternity leave policy is the fact that the vast majority of school teachers in the US are women. Many of them become mothers during their careers and, without adequate financial compensation and time off to care for their own children, many of them don’t return to teach the children of others. Regardless of the mother’s profession, US Census data indicates more than half of the nation’s children under age 5 have moms who work. As many as 57% of all babies less than a year old have working moms. Mayer’s speedy return to work may prove that mothers can effectively return to work shortly after childbirth but it also highlights the disparity in voluntary maternity leave policies across the US and the need for a standardized policy that evens the playing field for all new mothers, regardless of socioeconomic status and job rank. Whitlock, Martin. "Marissa Mayer has the choice to skip maternity leave. Not everyone does." The Guardian. Guardian News and Media Limited, 3 Sep. 2015. Web. 4 Sep. 2015. Mead, Sara. "Parental Leave Is an Education Issue." US News & World Report. US News & World Report LP, 3 Sep. 2015. Web. 4 Sep. 2015.